The SKS Raceblade Long II is an ultra long clip on mudguard set for road bikes with 25c tyres. Always stay protected, during the wetter winter months and the odd but heavy summer downpour. The end of each mudguard extends to below the hub axles. This length ensures a full coverage, meaning you, and also the cyclist behind you, are spared from splashing. They can be perfectly adapted to the radius of the wheel by adjusting the length of the stays. 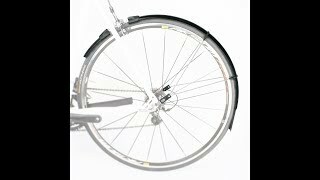 Once the metal mounting brackets are fitted to the bicycle the mudguards can be clipped on and off in seconds making them ideal in case of need. Brackets attach at brake bolts and skewers.